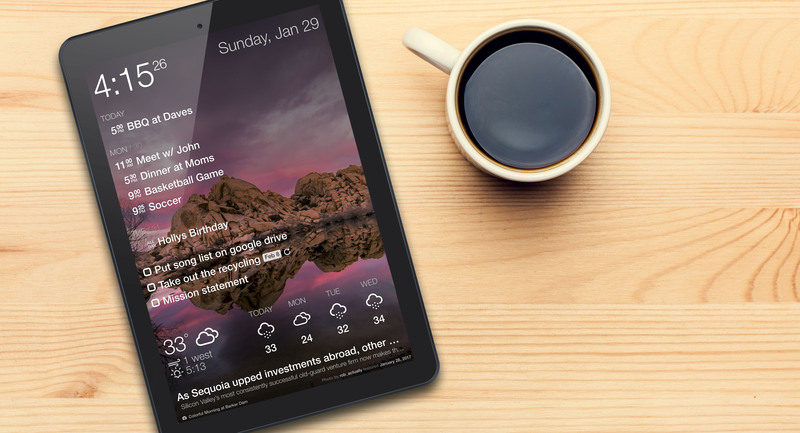 Introducing DAKboard’s new “Mobile/Tablet” layout! The new layout is optimized for smaller screens like tablets in the popular 7-10 inch range. We’ve taken the time, calendar and to-do lists and put them all in a single column that can occupy the full width of the screen. The weather has been simplified, only showing the daily high temperature. Lastly, the RSS feed has been moved to the bottom, and only occupies a maximum height of two lines. All of the sections are still configurable, and can be enabled/disabled in the options. All of this combines to create a simplified display that looks great on smaller devices! To use the new layout, in the DAKboard options, navigate to “Screen”, and select the “Mobile/Tablet” option. We hope you find this useful! As always, let us know if you have any comments or suggestions! This is looking really really good. I only have one problem. When trying to have my calendar show up i get the following error? Hi David, this usually means there’s too many events on your calendar. Send us an email with your username and we can take a look. Thanks! This is awesome! I appreciated you making a separate layout for me and my tablet, but then following it up with an app? So awesome. My hacked together idea of the fullscreen browser+DAKboard page was working fine, but I love the idea of the all in one. And on the Amazon Store opens the use to the cheap Fire tablets. Not available for Apple? Wanting to use my old iPad for a kitchen Dakboard! Not yet. You can use a web browser on your iPad however! What’s the status of the iOS app? Is there any way to automatically start things when the tablet starts? Right now I have to click on the program icon, then click on the VERY small link on the new user login window for existing users, and then type in my user ID and password. Painful. An autostart app would do the trick, I just can’t decide which one. Would Kiosk Pro work? Yes, a couple of apps can be installed on an Android device that will auto start an app, and keep the screen from turning off. One is called “Startup Manager” and can installed and configured to open a specified app at startup (in this case, DAKboard). The second app you’d want is called “Stay Alive!” and will keep the screen on and prevents power- saving settings from turning off the screen. I need some more information to figure out if this will work for me. i am looking for a standalone screen (like a digital photo frame) where i can have my calender displayed with my own photos in the background. The 24″ one is too big for me. What are my options? Also, will dakboard sync with outlook calendar? DAKboard is almost exactly what I have been looking for to keep my 2 college kids’ schedules synced with the family and viewable at-a-glance – just like the old-school wall calendars used to do. BUT – the lack of an iOS app in 2018 is mind-boggling. Is there an intention to add an iOS app? When? Previous Previous post: DAKboard Adds To-Do Lists!